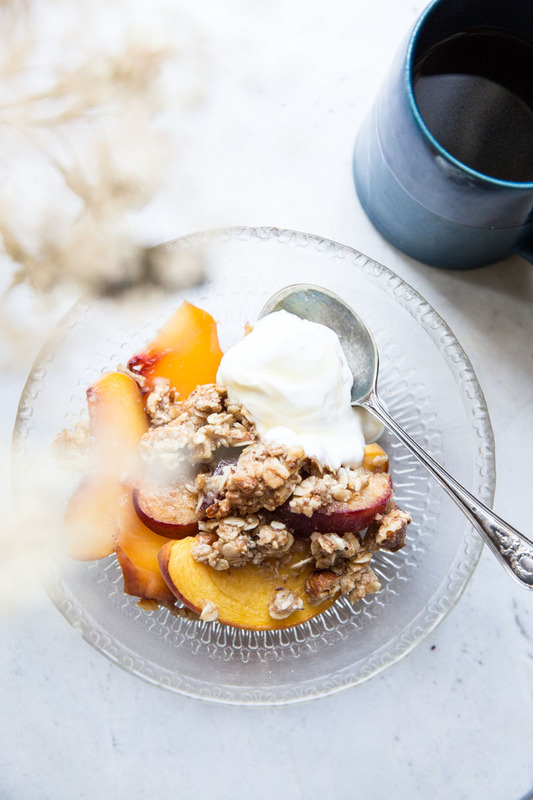 This Peach Breakfast Crisp is hands down my favorite thing to eat in the morning as of late. 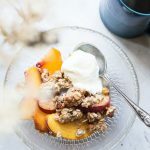 It’s loaded with healthy oats and nuts, juicy peaches, and we always top it off with some Greek Yogurt. Who says you can’t have dessert for breakfast?! I’m holding on tight to all of the flavors of Summer… especially peaches. 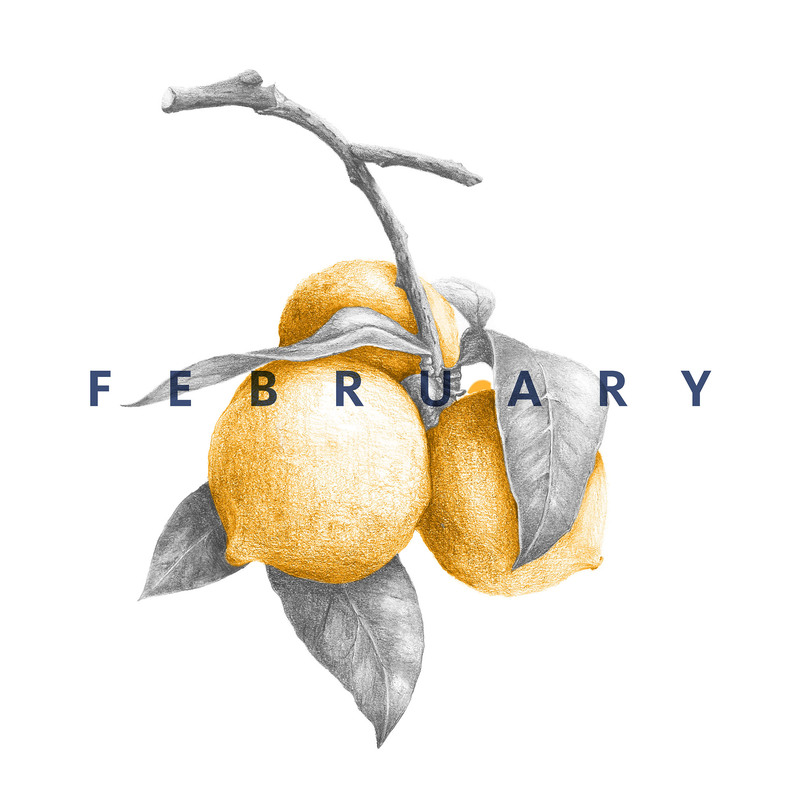 Though I’m ready for the cooler weather, I’m not sure I’m ready to give up the plentiful stone fruit and ripe produce that comes with the harvest season. If I could pick just one item to carry through, tastefully, all year long, it would definitely be peaches. In the past, I’ve made canned peaches in a honey simple syrup, or frozen them, to ensure a few bites of sunshine mid winter. But this year, I’m just savoring them while they are here and plentiful. 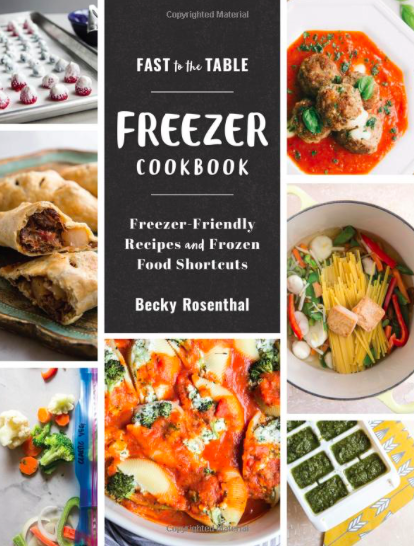 • There is no sugar or flour in this recipe making it gluten free and vegan. If your fruit is less sweet or unripe feel free to sprinkle a little sugar on top (you may use coconut sugar or maple sugar too). 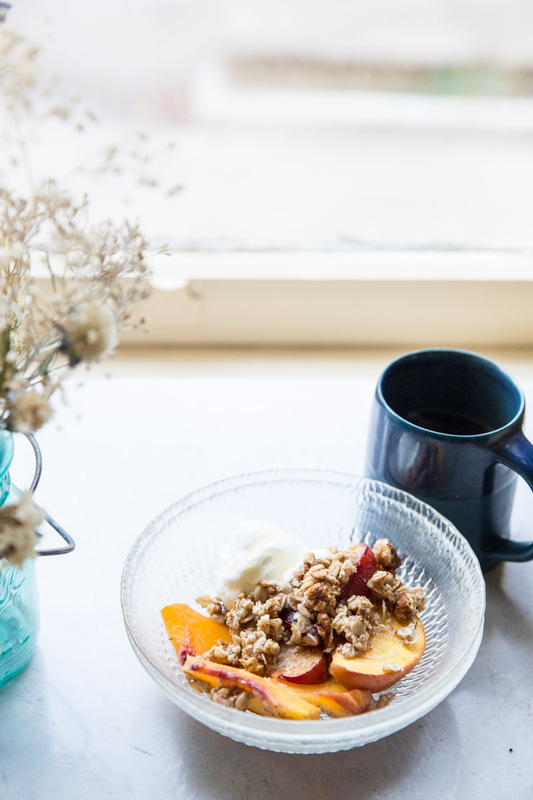 The topping and fruit alone should be sweet enough to satisfy all of those with a sweet tooth at breakfast time. • For the almond meal, you can grind up whole almonds in your blender until a coarse powder is formed. You may also use almond flour. 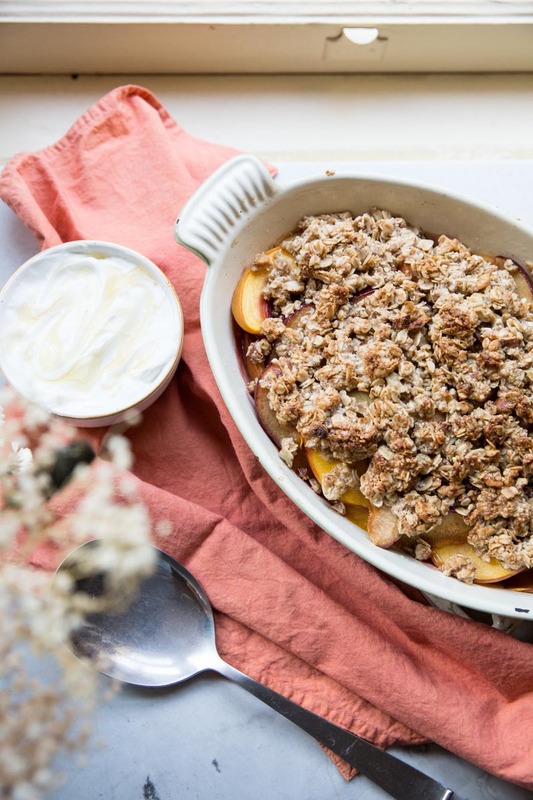 • I like to make the crumble topping the night before then all I have to do is quickly assemble and bake in the morning. 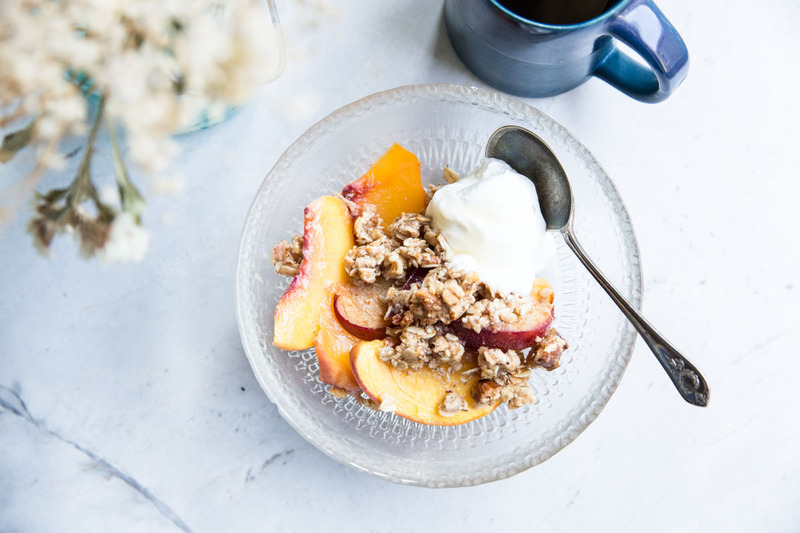 This healthy Peach Breakfast Crisp is like having dessert for breakfast but with the naturally sweetened oat and almond topping and perfectly ripe peaches no added sugar is needed. 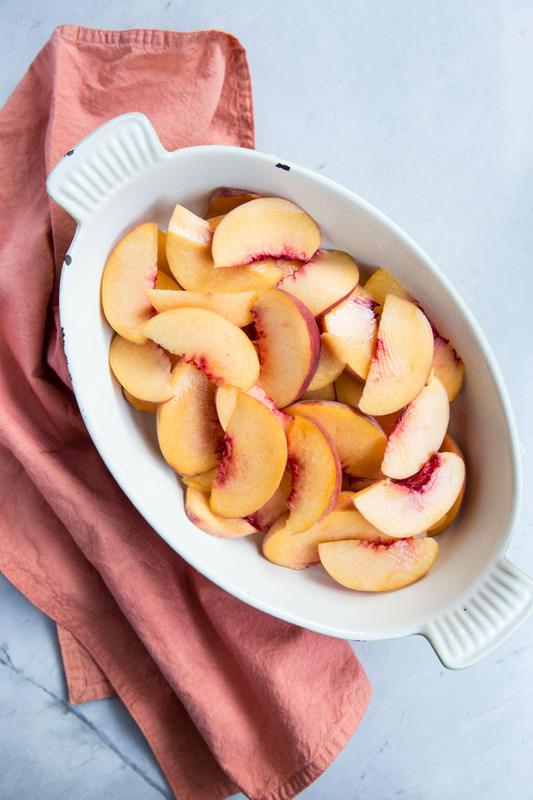 Preheat oven to 375 degrees and lightly grease a large rectangular or oval baking dish. .
Wash and slice the peaches then transfer the slices to the prepared baking dish. In a medium mixing bowl combine the oats, almond meal, almonds/walnuts, cinnamon, salt, coconut oil, maple syrup, and vanilla. This can be prepared the day before. Top the sliced peaches with the crumble mixture and spread out evenly. Bake on the middle rack for 30 minutes or until top is browned. Let cool for 5 minutes. Serve with Greek yogurt and extra honey or maple syrup. If your peaches are less ripe or less sweet for some reason feel free to sprinkle on some sugar to get them a little sweeter and juicier (1 tablespoon should do the trick). I like to make the crumble topping the night before so all I have to do is quickly assemble this before baking it the morning of.